Plain Vanilla: Experiment: Mexican Coke Equals American Ingenuity? 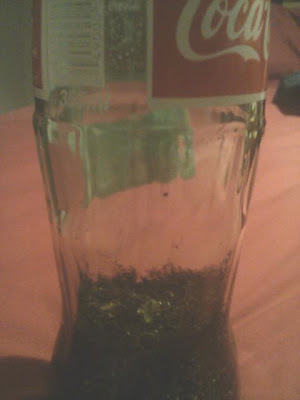 Experiment: Mexican Coke Equals American Ingenuity? At the café where I work, we started selling Mexican Coke. Mexican Coke is supposed to be better than American Coke, which is a complete reversal of the whole chocolate situation. This kind of Coke made with real cane sugar instead of corn. Very clever, Mexico. Very clever. Now, I'm not a really big or even almost medium cola fan. Soda in general is the kind of thing that I feel like drinking once every three-or-so months, and when I do feel like soda, I definitely don't feel like a bitter version of root beer. One thing I do love, though, is the iconic glass bottles that they only have in the commercials. AND, apparently, Mexico. Why Mexico gets the glass bottles, I don't know. I think they must still be mad that they can't make decent chocolate. Most things go back to chocolate one way or another, I find. 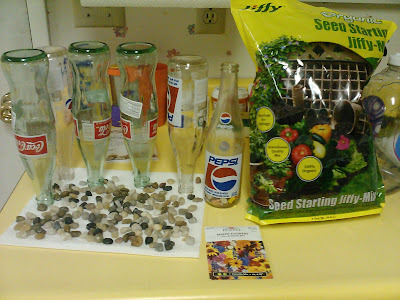 One day, I somehow got the idea that these bottles would make excellent vases. You know, I'm all about repurposing/saving the Earth. For example, when I was unemployed and couldn't afford to buy new clothes, my wardrobe consisted almost entirely of things that my sisters accidentally left behind while they were visiting. You're welcome, planet. And after thinking about using them as a flower vase, I thought it might be even cooler if I actually grew flowers out of them. I know, right? Genius. The only trouble is that I really know nothing about flowers. I know how photosynthesis works, and that seed plus soil plus water plus sunshine is supposed to equal plant, but that's the extent of my knowledge on the subject, really. But I thought I'd try it anyway, as a sort of experiment. Can Cecily grow anything? Well, I've managed to keep my poinsettia alive this long, so who knows what I'm capable of? Who knows? 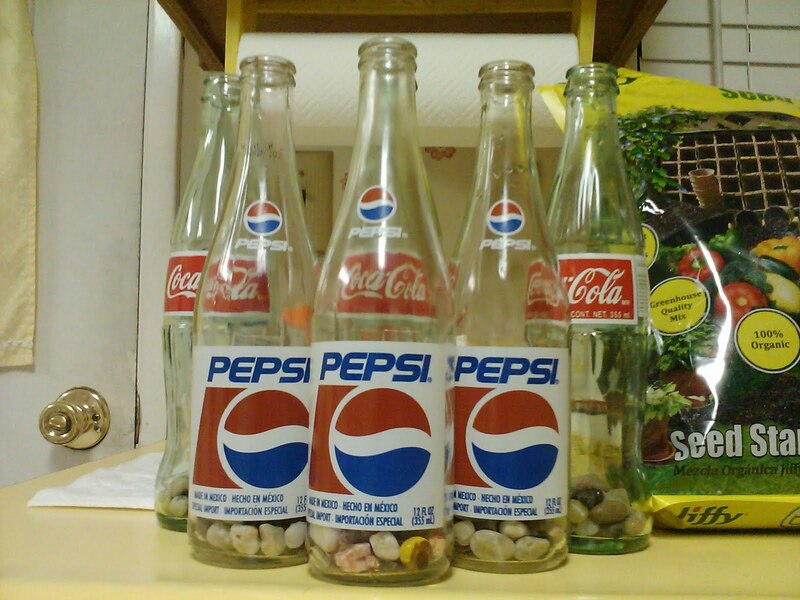 You may have noticed a few things: first, that we ran out of Coke and started selling non-iconic Pepsi bottles halfway through my attempt at collecting them; and second, that all the bottles except for one are upside down because they are drying after I sanitized them in bleach water. I decided that if this were to be a proper experiment, I needed a control, so I left one of the bottles as-is. I realize that it's actually a trivial difference and that it will probably no effect the outcome at all. It still manages to make me feel more scientific. The packet says that there are supposed to be Cynoglossums, Calendula, Iberis, Coreopsis, Centura, Linum, and Gypsophilia seeds in there. I can't tell which is which, seeing as I'm not sure yet if these are real flowers. I may have been had. I promise that it's there. 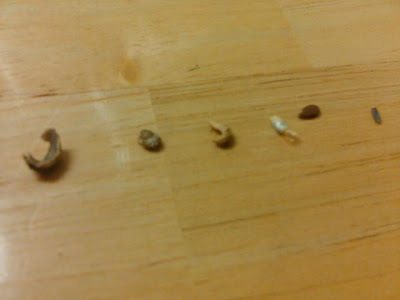 And, on Day Seven (today), there was a second sprout! It's very exciting. I forgot to take a picture while the sun was up, and my phone's camera is so lame that I guess I'll have to wait until tomorrow to add it. I guess you'll just have to use your imagination? Anyway, I'm pretty thrilled at how this is turning out so far. I really hope that it manages to work out, and I plan on giving you exclusive updates. You too will know the thrill of watching my plants grow. You're welcome. You're welcome, Mr. President. You're welcome. Gosh, it seems like I'm just doing favors for everyone these days. *I avoid putting pictures on this blog for one simple reason: my entire family is filled with professional photographers, and I'm something of a squib. I even took these on my phone. It's very embarrassing. Almost embarrassing as those group therapy sessions with Mr. Filch. I really wish he would stop hugging me. I LOVE IT!! I can't wait to see them grow. It makes me want to plant something. And I LOVE your reference to the State of the Union. Classic! That sounds like a lot of fun. Last fall my brother-in-law gave me some plants, and he said they would probably die in a month or two, but I'm happy to say that they are flourishing and almost too big for their pots, and it's been really fun. I wish you as much fun and success with your bottled plants. You make me laugh and inspire me too! Love you Cec!